Question: What do you get when you cross a 92 m.p.h. fastball with a young man from Ohio who harbors an intense love of card magic? Answer: The Guinness World Record for throwing a playing card further than anyone else in history. The young man is Rick Smith, Jr. and on March 21, 2002, he obliterated the world record for card throwing with a laser beam toss of 216' 4" eclipsing the previous longstanding mark by over 15'! Card Throwing - Speed, distance and accuracy; throwing techniques, grips, stances, warm-ups and multiple card throws. Card Throwing Stunts - Slicing celery and knocking down soda cans. 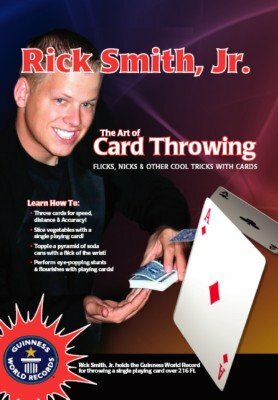 Card Flourishes and Stunts - Flick and catch behind the back; flick and catch in the center of the deck; flicking cards from the top and center of the deck; rapid fire flicking; thumb shooting; finger shooting; overhand shooting; flick tricks; fire flicking; back flicks; flick productions; card kicking; boomeranging cards; pop-up card productions; cross-over cards and much, much more!